The other evening, I rolled out of my bed from a nap (yes I take evening naps--don't judge) and decided I was going to make my paper bag skirt and I was going to make it now. Slightly groggy, I laid out my fabric on the floor, chalked some general lines, and started to cut. 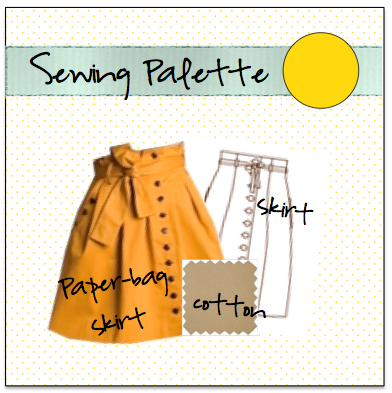 I referenced Cotton and Curls for where to place the pleats and Grosgrain for a general pattern + my Marie Skirt. These patterns have you taper in at the leg, which creates a pencil skirt type shape. What a "paper bag" design really should be is a rectangle with pleats, and the design I was originally eyeing has definitely more of an A-line. Because the skirt wasn't as full as I'd intended, I wanted to add a back slit for ease of movement. I ended up doing just a regular ol' slit (unpicked the seam a few inches and pressed the seam allowance to either side), but in the future I might try a back vent, with a great tutorial by A Fashionable Stitch. Of course, I don't think I made the slit long enough, because the first thing that happened when I stepped onto my bike today was a big ol' ripping sound as the seam broke. I guess that was just nature's way of helping me to adjust to a more convenient slit length. Overall, I'd call this skirt a good first draft. My half-awake pattern-making meant the hem is not exactly on grain, and that each side of the front is a slightly different length, leading to some of that puckering you see in the pictures. Because it was wool (I know it's wool because it smells like wet dog under the steam iron), I was able to press away some of the gathers, but overall the skirt just isn't as "crisp" as it should be. Maybe next time I'll make it in a mustard cotton. The skirt is finished with belt loops, pleats, and a front zip that goes all the way down the front of the dress. I love this skirt Meg, the paper bag wait detail looks lovely! Cute skirt. You could make it up in lots of colours! I'm so like you in that I have spontaneous moments of sewing. I just get the urge and start sewing and usually stop 12 hours later. The skirt looks great. Don't worry about the little mistakes. Nobody will notice! This skirt is adorable (and I also love the top you paired it with!). Paper bag skirts are such a cute style.